The Lies & Warping of Sikhi by Yogi Bhajan's 3HO / Sikh Dharma & SikhNet ! Let's be perfectly clear here, Yogi Bhajan's so called "Khalsa Council" of Sikh Dharma didn't close their meeting with a typical bhog, with ardas and vaak. Rather they did the Tratakum meditation of staring at Yogi Bhajan's tantric photo! This statement is such a blatant and outrageous lie that it is breathtaking in its mendacity. I was so shocked, hurt and angered by this statement that it took me several days to compose myself so I could actually write about this in a relatively detached frame of mind. How could anyone who has the slightest knowledge of Gurbani say this? How could the other members of the so-called “Khalsa Council” let him say this without challenging such an obvious mistruth? How could Sikh Dharma International put out a newsletter to their membership containing such a falsehood which is insulting to Gurbani? “Yogi Bhajan taught that you could be liberated in forty days if you practiced kundalini yoga. Can anyone who is familiar with Gurbani tell me where such ideas occur in Guru Granth Sahib? Of course, they don’t and there are many, many more ideas that Yogi Bhajan taught that have no relationship to Gurbani whatsoever. In fact it would be truthful to say that Yogi Bhajan’s teachings that have no relationship to Gurbani vastly outnumber his teachings that do. The biggest tragedy is that – if this kind of lie goes unchallenged – it will become part of the ever growing legend and personality cult that is growing around Yogi Bhajan. I have already had 3HO yoga students ask me where in SGGS they can find Yogi Bhajan’s meditations. 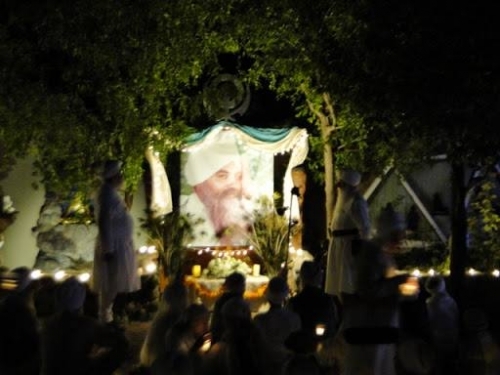 For almost forty five years, Yogi Bhajan and his Bhajanist followers have played fast and loose with the truth. Their deceitfulness has by and large gone unchallenged. Thus such out and out falsehoods as “Yogi Bhajan was a master of Kundalini Yoga by the time he was sixteen years old” and “There are two hundred and fifty thousand American Sikhs” have become accepted as facts in the Bhajanist community, as well as among many Punjabis. Finally people – Sikhs and non-Sikhs - are standing up to say “Enough!” Yet this does not stop the Bhajanists from continuing with their campaign of half-truths, misrepresentation and outright lies. The attached newsletter from the recent Bhajanist “Khalsa Council” meetings is a case in point. "The Siri Singh Sahib was blessed by Guru Ram Das to be a great Sikh leader. We are Sikhs and Khalsa because we have been touched by the Guru. The Siri Singh Sahib recognized this clearly. He took his first group of students on a Yatra to India in 1972, there they took Amrit Sanchar." In spite of no previous mention of Sikhi being the focus of the trip, day after day these bewildered Americans were taken to gurdwara after gurdwara, with Yogi Bhajan telling the Punajbis that these were American Sikhs that he had created. Naturally the presence of “American Sikhs” was exciting for the Punjabis and everywhere the group went, huge crowds gathered. Of course Yogi Bhajan was speaking in Punjabi which the hapless Americans could not understand, thus they had no idea what was going on and how he was presenting them as Sikhs. Participants in the experience recall being told what to do and feeling like they were merely pawns in a larger game. While the party was in Amritsar, Yogi Bhajan ordered several of them to take Amrit Sanchar. They had no idea what they were getting into, no idea what the ceremony was about and especially no knowledge of its immense historical and spiritual significance. This is well documented. Only one of the eighty-five people who went to India still considers themselves to be a Sikh. The overwhelming majority (about 75 of a party of 84) left Yogi Bhajan as soon as they returned to the USA. There was a documentary film crew who were part of the India party. When they returned to the US, they edited their footage into a complete film. Dr. Trilochan Singh says: “The scene shifts to Amritsar …The Americans are lodged in the precincts of the Golden Temple….Some of them, who continued to declare in the film that they came for Yoga and not for Sikhism, continue to smoke, and to burn candles before Yogi's picture. to the reluctant and ignorant Americans, ….. They are huddled together and told that all they have to do is to keep their eyes open and say Vah-Guru ji k a Khalsa and Vah-Guru-ji-ki Fateh every time they are given baptismal water. …While baptism is being administered in the film, one can hear laughter, giggling and indecent disturbances from outsiders who are watching and commenting. The whole spectacle is so sacrilegious and an open insult to the authentic and traditional method of administering Sikh baptism that I do not think Sikh baptism was ever made such a mockery and empty ritual as was done by the present S.G.P.C. leadership …Those who are receiving baptism do not know what they are receiving, and those who are administering baptism do not care to explain what they are giving. “The greatest sacrilegious act and even sin by those who act as Panj Pyaras is to administer baptism to those who do not deserve it and those who are not fully prepared for it. The giggling, the laughter, undesirable utterances by outsiders (people other than Panj Pyaras), and other noises make the ceremony a humiliating and disgusting sight. In 1987, Pamela Dyson (known in 3HO as Premka Kaur Khalsa), Yogi Bhajan’s long time secretary and mistress, sued Yogi Bhajan, 3HO and Sikh Dharma alleging – amongst other things -- Fraud and Deceit; Assault and Battery; False Arrest and Imprisonment; Intentional Infliction of Severe Emotional Distress. “28. It was during this trip to India that defendants claim that I took Sikh vows. It is true that I participated in a ceremony, which Bhajan orchestrated, at the temple at Amritsar. However, at that time, I understood very little about the Sikh religion, or what the import of the ceremony might be. I did not make a decision that I wanted to become a Sikh or to take Sikh vows prior to going out to the temple or prior to taking the trip to India. “29. This was one of many instances, like the abortion related above, in which I did not choose my conduct or the way I wished to proceed with my life. Bhajan made the choice of what my action would be, and presented it to me as decided. In spite of all this, the Bhajanists present this event as a great step forward for 3HO and for Sikhi. The unspoken suggestion is that, even back in 1971, a great many Americans wanted to be part of the Khalsa. Obviously this is not true; the Americans who participated in this Amrit Sanchar had absolutely no idea what was going on. This is a great example of how the Bhajanists present incomplete information to show themselves in a better light. It’s now time for concerned Sikhs everywhere to speak out about this – and many other - untruths. 3HO, Sikh Dharma and Sikhnet have a massive advantage in terms of resources when it comes to publicity and marketing. But if enough people speak out and let others know about these deceptions, we can turn things around.